Heat Exchanger Design, Inc. strives to offer the most innovative and economical heat transfer solutions while adhering to the highest standard for quality in the industry; benefiting customers both locally and internationally in the fields of Petroleum, Petrochemical, Power, Food, & other industries worldwide. Benefit customers worldwide in a variety of industries by providing affordable and superior products. To offer the most innovative heat transfer solutions with a strong focus on engineering, forging new paths for design. Conduct business with local, domestic, and international vendors of the highest caliber. 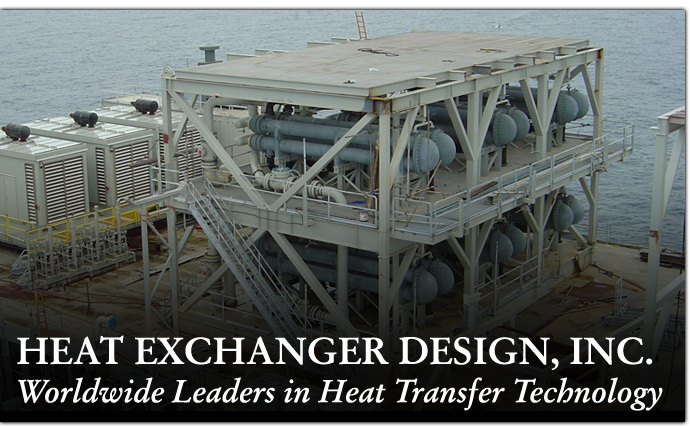 Heat Exchanger Design, Inc. offers more selection in heat exchangers than any of its competitors. Our standard line of heat exchangers includes, but is not limited to: HAIRPIN (Double Pipe & Multitubes), SHELL & TUBE (Bare & Finned Tubes), FUEL OIL LINE & SUCTION HEATERS, CHILLERS, CONDENSERS, TANK HEATERS, ECONOMIZERS, & SPECIAL APPLICATION heat exchangers.